Jim Sadler was born in the UK in 1960 and studied Sculpture at the University of Wolverhampton 1999-2001 and Product Design at Manchester Metropolitan University 2014-2015. He is also a trained lecturer and graduated with a P.G.C.E from Edge Hill University 2010-2012. During the past 20 years Jim Sadler has gained an international reputation through his sculpture, furniture, drawings and prints. He has undertaken numerous large-scale commissions and exhibited widely. His work is held in public and private collections throughout the world including Italy and France. A selection of his public sculptures can be found in many urban and rural locations throughout the UK including Shrewsbury, Warwick and Wales and his work is in the permanent collections of the Arts Council of England and the British Film Institute amongst others. His practice has always been informed and inspired by the study of natural phenomenon and its subjective impact on our emotions. In recent years his work has become increasingly concerned with the underlying principles determining evolution and the forms it produces. Jim was awarded a post graduate diploma from the University of Wolverhampton after studying 3 Dimensional Design in relation to sculpture in 2001 and a Masters in Product Design from Manchester Metropolitan University in 2015. His current research has concentrated on digital fabrication of modular design to advance the development of his practice and this now informs his current sculpture and furniture. As a contributor to the retrospective V&A Pink Floyd exhibition (2017) ‘Their Mortal Remains’, Jim’s work – in the form of a ‘live’ multi-channel ‘quad’ mixing console – was set as a working exhibition piece in the ‘Division Bell’ room of the exhibition. 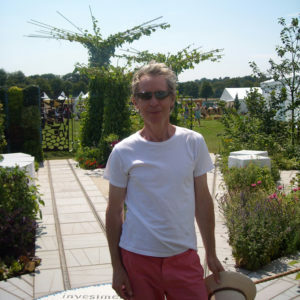 As a member of the design team for the Reaseheath large scale garden at Tatton Park (2014) Jim’s work Skip – a large mild steel sculpture – helped influence the judges and the garden was awarded a RHS Gold. Jim also works with other artists who call on his array of skills in many materials, brick and stonework being part of his adaptable ability to work in many disciplines. Commissions include Merioneth Paradoxides in Barmouth, North Wales (2007) which won a prominent permanent site in Orielton Woods Dripping Children, a large laser cut mild steel abstract for Warwickshire Council (2005) and a Commemorative Sculpture for English Heritage (2004) which immortalizes the Battle of Shrewsbury (1403).